Why was spinach the secret to Popeye’s legendary strength? Because of one little mineral: Iron. Now, while history has shown that spinach doesn’t have anywhere near as much iron as the creators of Popeye (and the world at large) believed at the time, that doesn’t at all diminish the importance of the mineral. Since the days of Popeye, science has revealed just how important iron is to the human body. This is especially true, however, for the athlete. As a key component of both hemoglobin and myoglobin, iron plays a major role in oxygen delivery throughout your body. This oxygen, in turn, keep your muscles fueled and operating properly. An adequate supply of oxygen to the muscles, by means of myoglobin, is also important in supporting a health metabolism. In addition to it’s oxygen-carting abilities, iron is also necessary for nearly all biological functions. This mineral is needed for health growth and development of connective tissues, as well as many hormones. Ultimately, almost every cell in your body depends on iron in order to get it’s job done correctly. Just to illustrate the importance of iron for athletes, it’s worth considering a recent review that was published in the Journal of Nutrition. Based on their analysis of 22 different studies, the researchers found that daily iron supplementation greatly improved the exercise performance of women. The subjects performed at higher intensities, greater efficiencies and with lower heart rates. Considering the role that iron plays in making sure oxygen gets to where it needs to be, it’s really no surprise that athletes depend on this essential mineral. What may come as a surprise, however, is that athletes are at a significantly higher risk of being deficient in iron than most people. For starters, athletes need more oxygen. Logically, then, this means that they also need more iron. This is particularly true of endurance athletes who train at high intensities because large amounts of oxygen need to be transported quickly both during and after the activity. Muscle growth also requires more oxygen which, again, increases the demand for iron. This important mineral is also lost in sweat and, since you’re probably perspiring as a result of exercise, that means you’re losing iron when you need it most. An often overlooked reason for iron deficiency in athletes involves in high-impact nature of many activities. While potential blood loss from nose bleeds and other injuries is probably not news to you, foot strike damage might be a new thought. As you run, especially on hard surfaces, the blood cells in your feet suffer significant damage. This can also contribute to blood lose and, by extension, iron deficiency. Combine all of these factors with the athlete’s tendency towards restrictive diets and it’s easy to understand why iron is a special concern for those of us living an active lifestyle. Naturally, the tendency at this point would be to start supplementing with iron on a regular basis. But don’t jump the gun. It is possible to overdose on iron which can cause toxicity and deficiencies in copper and zinc. Only take iron supplements under the direction of a doctor after being diagnosed with a severe deficiency. That being said, however, a proper diet can go a long way in keeping your iron levels up. To increase your iron absorption, combine an iron-rich plant like multigrain bread with a meat. Adding a food high in vitamin C will also encourage iron absorption. On the other hand, tea and coffee both decrease iron absorption when taken with an otherwise iron-packed food. What tips do you have for managing your iron levels? Please share them in the comments. Today you’ll turn on your television and probably see stories about the missing flight, the sinking ship, the crazy spring weather…but you won’t see a story like last year when the Boston Marathon turned into tragedy. Rather, this year the marathon found a happy ending–or “finish” if you will. For the first time in 29 years, an American won the Boston Marathon. Meb Keflezighi, 39, finished the race with a time of 2:08:37. At one point in the race, he had a 90 second lead, but in the final two miles, it narrowed to just six seconds. Keflezighi has made quite a name for himself in the running world. He won four NCAA championships for UCLA, won the silver medal at the 2004 Olympic Games, and came in fourth in the 2012 Olympic Games. The women’s race also saw a story play out. Rita Jeptoo of Kenya won her second-straight women’s division title. Her 2:18:57 finish set a new course record. Although none of us will come close to those type of finish times, we certainly can appreciate them. The hard work and natural athleticism of these top Boston Marathon athletes continues to astonish runners. Many of us can only look at Boston as a dream. I am proud of the saying “Boston Strong” that has been heard so many times over the past year. I think it symbolizes both the pluckiness of the city and the power of the athletes to do something so challenging. Congrats to all the finishers today! Muscle wasting, or atrophy, has become a sort of boogeyman in the world of health and fitness. This condition, though it can be caused by any number of illnesses, afflicts us all at some point as a result of prolonged inactivity and aging. But atrophy has a much higher cost than just a hit to your ego and the loss of your hard-earned muscle; Your health could be put in serious danger. If it’s left untreated, atrophy can lead to weakness, fatigue, an increased risk of injury and an overall lower quality of life. To be sure, exercise helps but it hasn’t proven to be effective in every case. While you might not be currently at a high risk for atrophy, you doubtlessly want to do everything you can to hang on to your muscle. According to a new study from the University of Iowa, the solution may come from an extremely unexpected source: Unripe, green tomatoes. Using a tool that had previously been developed by the Broad Institute of MIT and Harvard University called the Connectivity Map, researchers at the University of Iowa were eventually able to zero in on a small compound found in green tomatoes called tomatidine. After first identifying and isolating tomatidine, the researchers tested the effects of the compound on cultured human muscle cells. Much to their pleasant surprise, tomatidine encouraged noticeable growth muscle in this controlled environment. But results achieved in a test tube cannot always be recreated in a living organism. So, the next step was to begin including tomatidine in the diet of healthy mice. These trials produced two fascinating results: First, the mice that were fed with tomatidine were more muscular, stronger and had better endurance than the control group. Second, the tomatidine group did not experience a change in body weight. This suggests that tomatidine also has an mechanism for lowering body fat percentage, in addition to building muscle. The researchers came to the hopeful conclusion that tomatidine causes a change in gene expression that is opposite that of muscle atrophy. Essentially, this compound seems to be the antidote for muscle wasting. This research, while intriguing, isn’t a reason in and of itself to go stock up on green tomatoes. Why not? First of all, as the researchers themselves noted, we don’t currently know how many green tomatoes you would need to eat to get an effective dosage of tomatidine. Since the research has only been conducted in mice thus far, we also don’t know how much tomatidine is needed to get the same effects in humans. Second, the team of researchers made a worrying move based on there findings: They founded their own biotech company called Emmyon with the expressed purpose finding ways to incorporate tomatidine into enriched foods and medications. The company is also exploring a similar, but weaker, compound called ursolic acid that is found in apple peels. While their motives may be completely pure, it is worrying that no other researchers have yet studied tomatidine. Nevertheless, the current body of evidence does support the idea that green tomatoes could be an effective treatment for muscle atrophy. Not only that, tomatidine could effectively stimulate muscle growth is healthy people as well. Especially if you wear a water belt, you may feel inflammation in your lower back after a long run. It also depends on your posture. If you hunch, you are also susceptible to pain. First and foremost, inflammation relievers, such as over-the-counter medication, can help, as can padding the area with ice. Physical therapists at The Joint, in Rancho Bernardo, Calif., part of a nationwide franchise of chiropractors, suggest icing the back 20 minutes on and 20 minutes off for a couple of days. Once you start to add hill training, which often happens with you hit the trails in the spring, it is common to pull a few muscles along the way. 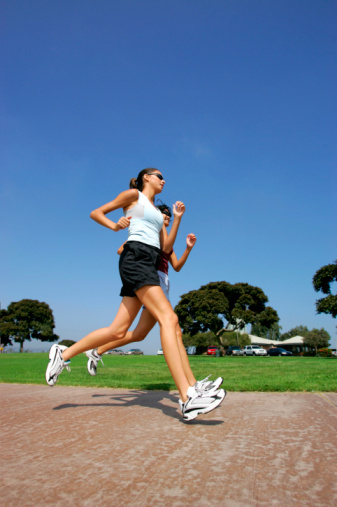 Lay off running until you feel better, otherwise you risk further injury. You should strengthen these muscles with high repetitions of weights to build endurance once the pain subsides. You can also add the dead lift into your weight lifting repertoire. Focus on a neutral spine and not how heavy the weight. Remember, you are just trying to build strength for running, not to show off to your gym buddies. When the weather begins to finally get better, it’s hard to harness your desire to keep running. When you run six or seven days a week, however, it can cause fatigue. Switch to light lifting or go for a bike ride. Cross training will actually help the running. As we finally start to see an end to what has been a particularly long and challenging winter for most of the U.S., the thought of being able to exercise outside in the sun is probably absolutely thrilling for you. In a past post, we explored some of the benefits of this so-called “green exercise” but paid particular attention to the physical advantages that getting outside can offer you. Several studies, however, have seen mental and even emotional benefits. What are some of these benefits and could they also improve your physical well-being? A large review, conducted in 2011 but the American Chemical Society asked the question “Does Participating in Physical Activity in Outdoor Natural Environments Have a Greater Effect on Physical and Mental Wellbeing than Physical Activity Indoors?” To find the answer, the researchers looked at data collected by a number of sources including 11 different studies that involved a total of 833 subjects. While none of the studies used in the review looked at any of the physical effects of exercise, some thought-provoking mental effects were observed. For example, those volunteers who exercised outdoors had more energy afterward and reported decreased feelings of anger, anxiety and depression. Most importantly, the subjects who went outside were more satisfied with their workout and more likely to repeat it than those who stayed in. The significance of this last fact really cannot be overstated. Workout enjoyment is a key factor is helping you form healthy habits and reach your fitness goals. If doing something as small as going outside is going to make it easier for you to adhere to a routine, then it becomes a very big deal. Although it’s not news that your mental health can have a powerful impact on your physical performance, and visa versa, a new study explored this link further. Specifically, the researchers asked children aged 9-10 to cycle for 15 minutes. One group was shown scenes of nature while the other had nothing to look at but the wall. At the end of the workouts, the children that got to enjoy a simulated view had significantly lower blood pressure than those who didn’t. While it’s true that similar effects haven’t yet been seen in adults, it’s reasonable to assume that the link is there. What’s truly fascinating about this particular study, though, is that the benefits were observed with a simulated natural scene; the children didn’t actually go outside. This suggests that simply watching footage of nature on a television screen mounted to a treadmill is more beneficial than nothing at all. Keeping this in mind can help you get the most out of your workouts even when weather or other factors confine you to the gym. It’s also worth noting that the study didn’t examine the effects of watching something besides natural scenes. Since many people like to watch the news, sitcoms or other shows, it would be beneficial to understand whether or not this could have the same effect on your blood pressure. The fact remains, though, that with the days getting longer and warmer there is more and more reason to move your workout outside. In the past few weeks, the subject of marathons has become an elevated topic in newspapers and websites. A recent study published in BMJ by Dr. Beth Taylor, et al. used several Boston qualifiers and their partners to show the effects of running on cardiovascular health. Dr. Taylor and her colleagues contacted numerous Boston Marathon qualifiers and inquired on their relationship status: Did they have a partner? If yes, did their partners run as well? If the answer was also yes, the researchers asked if both of them would be available and willing to have their heart scanned and cardiovascular risk assessed. It was split 50/50 for male/females. Partners’ ages were near the same but the majority of them were not active runners. At the Boston Marathon expo in 2012, exactly one day before the race, the participants visited a lab located next door and filled out a questionnaire about exercise and health histories and blood samples were taken. They then had their heart scanned using a noninvasive method. Basically, running doesn’t relieve you of aging, unfortunate genetics and bad habits that you formed before you started the sport. Is this surprising to you? Good news: the study showed marathon training is not bad for your heart as is often the myth in fitness. So it’s race day. You’ve been carefully preparing yourself for weeks, working up to your goal pace. For breakfast, you closely followed our recommendations for the perfect pre-race breakfast and you’re standing-by waiting for the event to start. But, you’re pre-race ritual shouldn’t end at breakfast. Before that call to start rings out, you still have one last, extremely important step: the warmup. On race day, as on any other workout day, the warmup is often woefully neglected. Sometimes, it’s just forgotten about. You may be late getting to the track or stressed about the even and it might just slip your mind to spend a few minutes warming up. This is understandable, though not completely excusable – as we will see. Or, shamefully, you might intentionally skip or skimp on your warmup. Often, when people do this it’s base on the belief that their warmup will waste precious energy that they need for the actual run. This is not only wrong, but totally counterproductive. If you’ve eaten properly that morning and in the days leading up to your race, you have more than enough glycogen packed away to fuel your race. Of course, the situation changes for long races like marathons but we’ll address that later. For now, let’s take a closer look at the goal of a good warmup and how to pull it off. Basically, the purpose of your race-day warmup is to get yourself up to speed before the race even starts. This is more important in short races, since marathoners can (and should) use the first mile or so as their warmup. You don’t have that luxury during a 5k. Since short races don’t give you a lot of time to waste on gaining speed during the actual event, your warmups need to be longer and slightly more intense. Try to end your warmup about 5 minutes before the scheduled started time to give yourself some wiggle-room if the race is early or late. Ideally, your warmup should be over precisely 2-minutes before the race, but that’s pretty difficult to pin down. Now that we’ve covered the basic principles involved, let’s get down to the details. For any sport, your warmup should simulate the movements that you’ll be performing during competition. This is sort of a no-brainer when it comes to running since walking or jogging is such a straightforward option. If you have a convenient way to measure distance, you can also do 100-meter strides but this not always be readily available and may tempt you to push yourself harder than needed. For a 5k, take about 15 to 30 minutes to gradually work up to your goal speed. As mentioned, the longer races call for shorter warmups so that a marathoner could get away with just a brief 5-minute jog before starting off. Just to get you in the right mindset, consider doing your warmup on the final stretch of your track if that’s an option. It may sound a little strange, but a big part of race day is mental and this little mind-trick will make it use for you to visualize crossing the finish line. In addition to the basic walk or jog as a warmup, there is a slew of other exercises you could perform to help you run better. We’ll discuss a few of those in a future post. In the meantime, do you have any tips on warming up? Please share them in the comments.